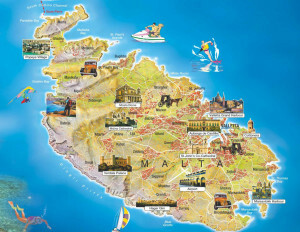 I became interested in exploring the islands of Malta and Gozo after reading claims that they were formerly part of Atlantis. 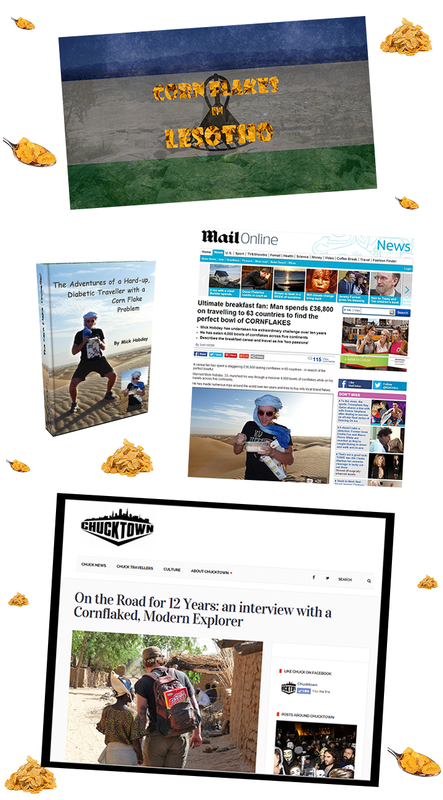 I hiked and hitchhiked all over the islands, camping every night on a 5 week film-making trip on the hunt for dolmen, standing stones, the mysterious cart-ruts and some of the oldest free-standing temples in the world. 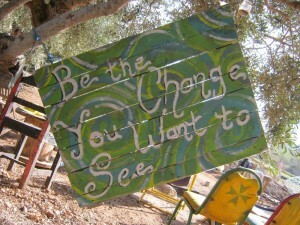 We didn’t just visit the ‘old stuff’ (I was travelling with Rich) we also spent a week volunteering at The Vortex – an eco-friendly project aiming to raise the consciousness of the planet by creating a self-sufficient, peaceful and creative village. 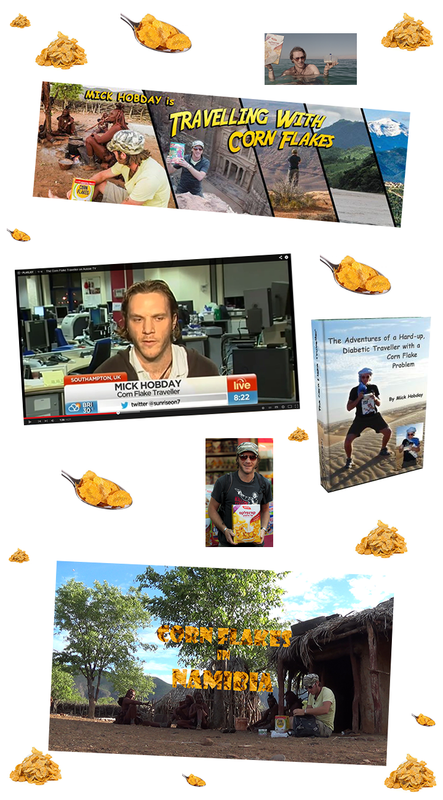 Our time there made them realize the importance of eco-living and self-sufficiency and it spawned a new Modern Explorers project – Eco-friendly Living. 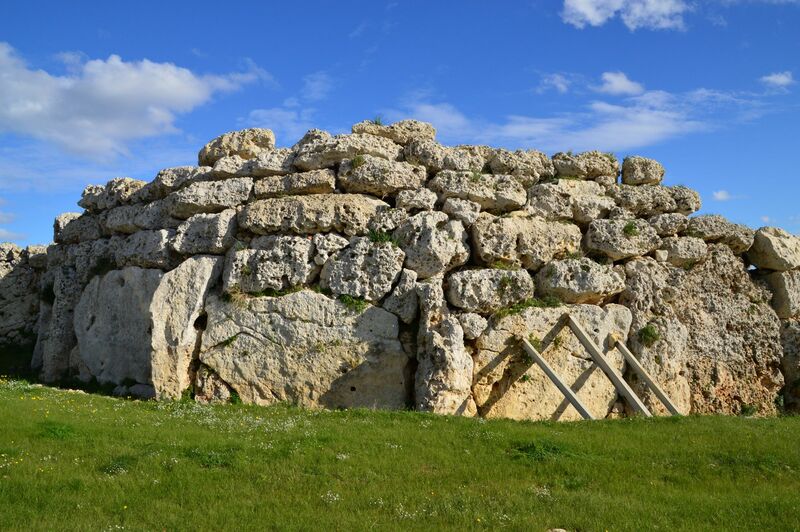 The Maltese islands possess a large number of prehistoric remains for such tiny islands including over 40 pre-historic temples, their frequency and attention to detail leave no doubt as to Malta’s importance in the past. 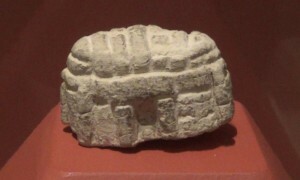 It was home to a race of neolithic builders whose temples show similarities to other European megaliths but also have unique features of their own. The temples no longer have roofs but drawings and a small model on display in the National Museum in Valletta reveal that the temples were once roofed. It appears that the roof was made from stone with a circle of stone that continue upwards, giving the room a bell-shaped appearance, similar to that seen in the Hypogeum. 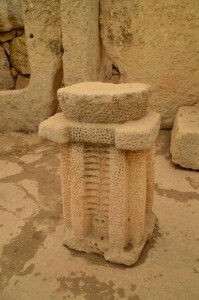 An interesting feature about the temples in Malta is that they come in groups or pairs, David Trump (a senior archaeologist on Malta) noted that of 23 known structures, 6 were alone, 10 were in pairs, and there was one group of 3 and one of 4. Amongst the paired sites one structure tends to be located on high ground, almost on top of a hill, while the other on lower ground. 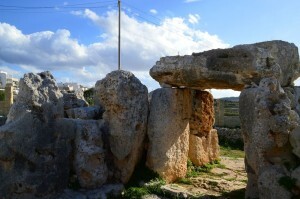 Examples of the Pairs include Tarxien and the Hypogeum, Skorba and Mgarr, Ggantija and the Xaghra stone circle and the most obvious, due to their close proximity and location, Hagar Qim and Mnajdra. There is evidence to suggest that the temple builders positioned parts of the temples so that they would line up with the sun and the moon at certain times of the year. Joseph Ellul identified that certain chapels of the Hagar Qim complex were carefully orientated towards the sunrise and sunset of the equinoxes and solstices. Ellul was even able to photograph how certain doors framed the full moon at the start of the 19 year Metonic cycle. There was also a suggestion on one of the information signs at the site that the holes that look drill holes were used to count the days between the heliacal rising of stars, beginning with the Pleiades on April 6 and ending with Beta Centaurus on October 2-3. If this is true then detailed planning went into these complexes using great powers of observation and precision. 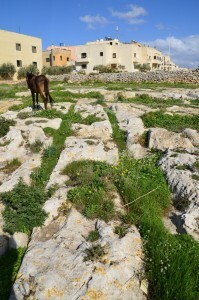 Aswell as the abundance of temples on the islands it is also believed that some of Malta’s prehistoric temples are currently underwater. The most spectacular of such stories was launched by Hubert Zeitlmair, who in 1999 claimed to have discovered an underground temple one mile off the Maltese coastline. 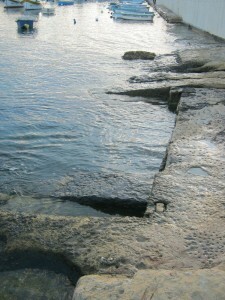 He organised a diving expedition off the coast of Sliema, bringing back footage of what some recognised as a megalithic temple, though left others – including official archaeologists – apparently unconvinced. These were the first temples we visited and were the most impressive in our opinion, Hagar Qim up on a hill and Mnajdra 500m away on the coast at the bottom of the hill. What impressed us the most were the carvings on the rocks, the altar covered in what look like drill holes, the small window/doorways and the massive size of some of the stones, one is the largest in any temple roughly 6.4m long and estimated to weigh around 20 tonnes and another is 4.5m high. 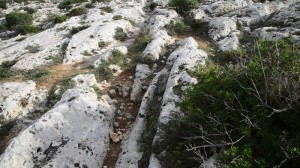 It is interesting to compare the 2 temples because Hagar Qim shows much more damage than Mnajdra despite the latter being right next to the sea and in harsher conditions, this is said to be because of the use of the less resistant globerigina limestone compared to the tougher coralline limestone used at Mnajdra. Next to Hagar Qim are the remains of another 5 apse temple and there are other megalithic blocks lying around. 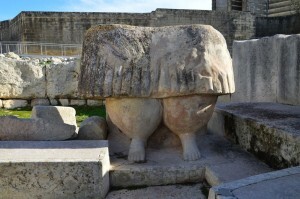 There is also an interesting stone that is supposed to be two pairs of ‘fat lady’ feet possibly of the Venus goddess which props up in many places on the islands, including in the shape of temples which when seen from the air could represent the curvaceous female body. This temple we visited as it was in the grounds of a hotel so looked interesting on camera. 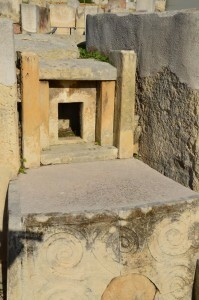 It had been heavily reconstructed but shows how highly the Maltese authorities regard their temples. Ggantija is a temple complex reputed to be the oldest free-standing structure in the world, it stands on the south-east slope of Xaghra hill in Gozo and is paired with what was believed to be a stone circle until a structure was found underneath that has been labelled Hypogeum 2. 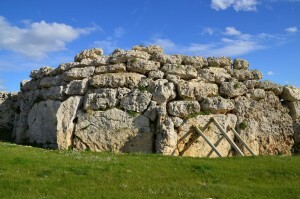 Ggantija comprises two temples, believed to have been built around 5,500 years ago, enclosed by a single outer wall built from huge blocks. They are so huge that when exploration of these sites began many centuries ago, the excavators lived under the impression that they were erected by an extinct race of giants, Ggantija actually means “Giant’s Place”. Visiting the temple was ruined by the modern devices scattered throughout, like lights and weather monitoring things. There were some interesting statues in the museum and one of the stones outside of the outer wall made my arm tingle as I touched it. We saved this temple until last as we were looking forward to this one but it was kind of ruined by fencing and modern things everywhere. There were some fascinating things to see here though for example there are more curves than in other temples, it is decorated with spirals especially on slabs that served as altars. The spirals vary in form; some providing a more plant-like display, while others are spirals that somewhat resemble those enigmatic spirals of the Irish site of Newgrange. Inside the huge reconstructed doorway is a highly decorated area which also has the giant goddess statue (or at least only her lower half) and in the opposing apse more blocks decorated with spirals and rows of animals. There is also a chapel with drawings of goats, sheep and pigs. Below the main altar, a flint knife and a mass of horns and bones have been found, suggesting the animals might have been sacrificed as part of the temple rituals. 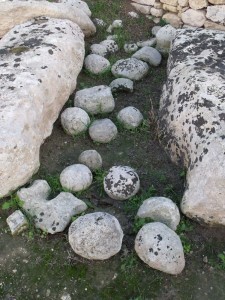 This was the only site where we saw the stone balls lying around, there was a display in the museum showing the theory of how the huge megalithic blocks were moved using these balls to roll them on. 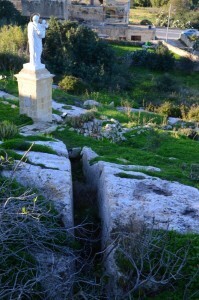 Tarxien also has its own spring suggesting that water must have played an important role on this site and it is more likely that the role of the spring, and its water, was spiritual, rather than economical. 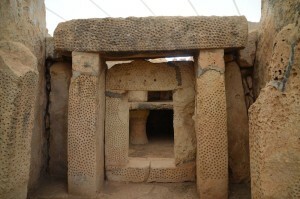 We visited these temples whilst volunteering at The Vortex as they are situated in Mgarr. 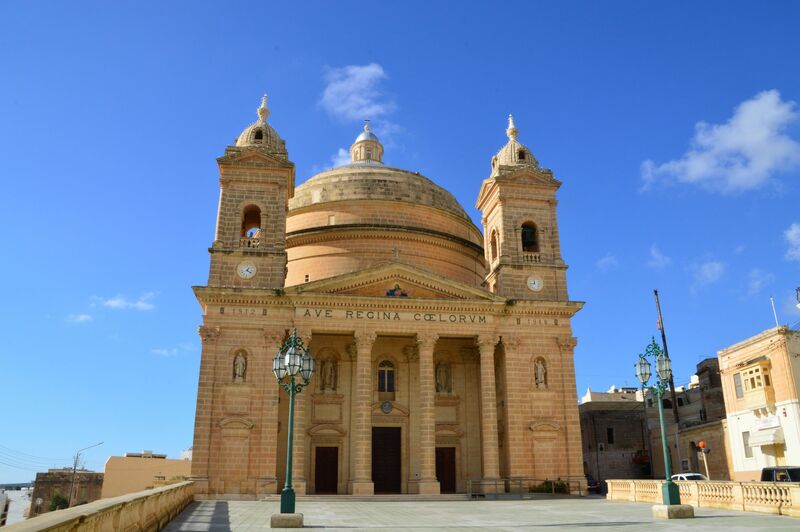 They are another pair of temples although it is thought that the Mgarr church was built on top of some ruins and that they would have formed a triplet. The temple sites are very ruined, Ta Hagrat being the larger of the two with a doorway and some apses and Skorba being basically a pile of stones. Next to Skorba temple is what is believed to be a settlement but again there wasn’t really that much to see. 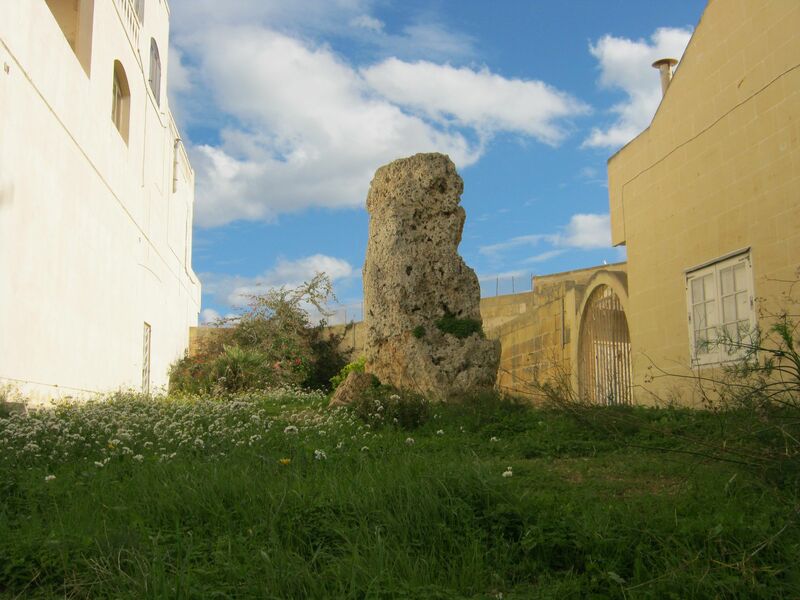 These temples are believed to be the oldest on the Island of Malta, it is thought the settlers started on Gozo and then worked their way east. We went to a temple close to St George’s Bay called Borg In-Nadur but like many, it was closed to the public. Interestingly this temple was right next to an area with cart-ruts and some large caves. We also tried to visit the Hypogeum but when we found out you had to visit in groups of 10, with a guide, limited time and you couldn’t use a camera we changed our minds, we also thought 30 Euros for a ticket was a piss take. Besides we wanted to sit in there for hours videoing, chanting and playing with the harmonics, a real shame as it is considered to be one of the greatest remaining structures from prehistory. The Hypogeum is an underground temple carved from solid rock with thousands of tonnes removed to create a structure that is at least three storey’s deep, a very impressive engineering feat indeed. It resembles the temples above ground with features such as trilithons , lintelled-doorways, a large cistern and a ‘holy of holies’ surrounded by ’embryonic’ chambers and it is also the place where the famous terracotta figure called the ‘Sleeping Lady’ was found. 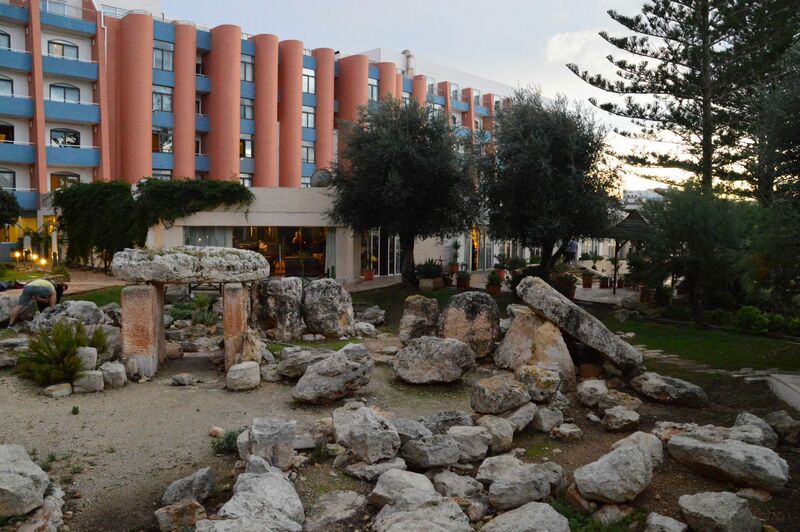 Although most of the Hypogeum is underground the entrance to it was built with megaliths, placed in what was presumably the natural entrance of the original cave and it is believed to be paired with the Tarxien temple nearby. The construction of this structure is enough to suggest a high level of intelligence and possibly technology was used but when you study the harmonics within the chambers it becomes a certainty. It is reported that from within these small cubicles, echoes from the ‘speaking’ chamber reverberate into a rhythm that is similar to the human heartbeat and a low voice can be heard anywhere inside the temple. It becomes even more mysterious when you find out that when it was discovered it contained the skeletons of over 7,000 people and some of these skeletons had elongated skulls. It is impossible to investigate these claims because a number of skulls found at Taxien, Ggantja and Hal Saflienti have disappeared, along with the 7,000 from the Hypogeum. 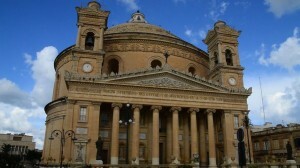 The churches on the islands are an interesting feature as they are huge and seem disproportional to the size of the towns they are in, the domes on the churches of Mosta, Rabat and Mgarr (3 of the churches believed to have been built on top of temples) made us wonder if there was significant telluric energies running through these parts. 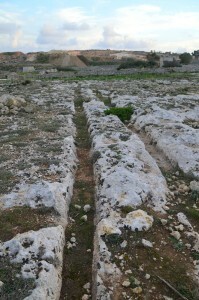 Cart ruts are another mysterious ancient relic found on the Maltese islands, we’d never heard of such a structure before our visit but have become fascinated by them due to the sheer number found scattered all over the islands. 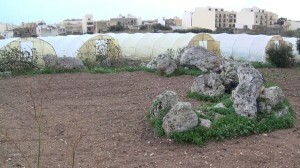 During our first week volunteering at the Vortex we came across 3 different sites without even looking and then during our tour of Malta and Gozo we saw at least another 10 different sites. They look exactly like what the name suggests, like carts have carved out wheel marks in the rock (which is the explanation we are led to believe), with depths varying from 10 to 70cm, often on the slope of a hill and often curving. We feel this explanation is a bit weak considering the amount of times the carts would have to traverse the same section of land (this is rock not sand), plus no wheels have ever been found on the islands, the ruts are found underwater and for the 70cm deep ruts the wheel must have been a metre and a half in diameter. Also some of the ruts are 20-30cm wide and there are multiple ruts overlapping (see photos below) which just wouldn’t happen, once a rut had started to be carved out over 100’s of years another one wouldn’t form overlapping with that rut as the wheel would fall into the rut already there. In Peratallada, Catalunya I came across another cart rut and they are also found in other parts of the world such as France, Southern Spain, Portugal, Switzerland, the Azores, Brazil and Bolivia (click for more info) but Malta has the largest concentration, here’s the sites we visited and why. 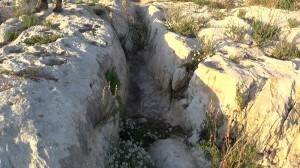 We came here to video the most impressive and densest concentration of cart ruts anywhere in Malta. It is difficult to count them all but there are probably at least 30 running across the side of the hill, many of which cross over, hence the name Clapham Junction. Within the area is a cave system believed to have been inhabited over many generations and there is also a line with an energy emanating from the ground, a line we could follow as it had a yellow algae growing on the rock. 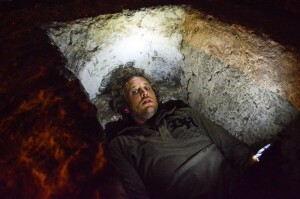 Some of the ruts were 60-70cm deep and 30cm wide. 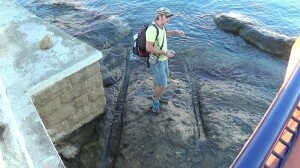 We visited this site on the shore of St. George’s Bay because the lines run into the sea and we thought it would be a great place to video and discuss the fact that there are cart ruts in the waters surrounding the islands. There are also circular shapes cut into the rock, channels and what look like quarries with rectangular shapes cut out of the rock. 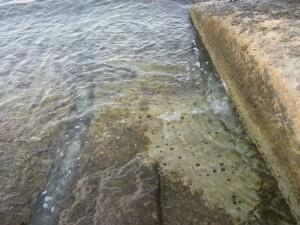 Graham Hancock writes of the existence of large numbers of cart ruts underwater at Marfa Point. He states that they are wider than those on land (he could put his whole body down horizontally), most ran in pairs but there were also single channels and the sides of the ruts rose about 30cm above the level of the surrounding bedrock. 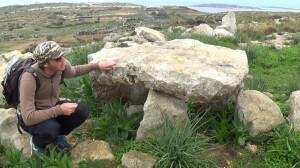 We stopped to video a couple of different standing stones and dolmen just to provide a link between civilizations from Malta and mainland Europe. 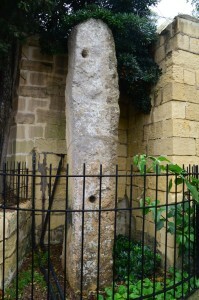 To the South West of Victoria on Gozo there is a 4.5m tall standing stone. There is a sign next to it saying that it is a monument from the Roman period because they found it next to a Roman road but we think this is mainly guesswork. There are 2 curious drill holes/cup marks on the front of this stone which is made from a stronger granite type of stone. 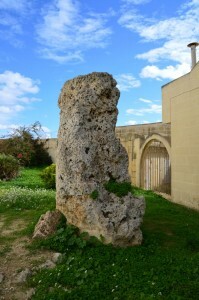 This isolated standing stone in Qala is wedged between a couple of houses, is about 3m tall and is made from a limestone that is being heavily eroded. 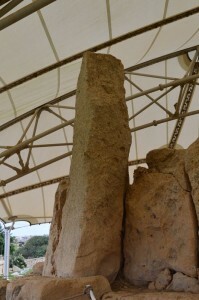 It is standing alone so likely to be a menhir rather than part of a temple although due to the discovery of shards and a greenstone axe-shaped pendant found near the stone people have suggested it may be the sole surviving stone of a temple. 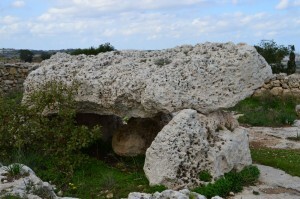 Ta Cenc Dolmen – We visited this dolmen with John Mizzi (the shaman we met up with). It is only about a metre tall with 4 orthostats but plenty of other stones lying around to suggest this once was a bigger structure. 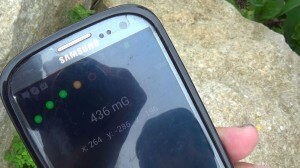 It is made from the same type of granite like stone as the menhir in Victoria and John had an app on his phone for measuring EMF and showed us an energy being emitted from the top. There were also cupmarks on other stones in the area. Two dolmen that we found next to the road that were made from the weaker limestone found on the islands and were being heavily eroded. Each one consisted of 3 or 4 orthostats and a capstone weighing about a ton. 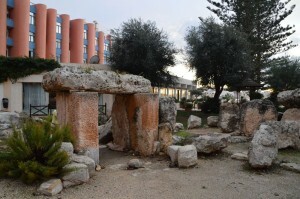 We tried to visit the Xaghra Stone Circle (close to the Ggantija temple) but it has been closed off due to the discovery of a structure/temple underneath known as the 2nd hypogeum. 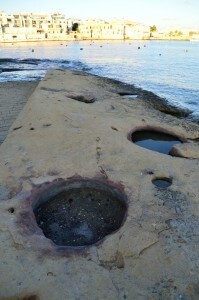 We visited a site just to the north of Ghajnsielem on the island of Gozo which is supposed to be a stone circle. There were megalithic stones around 1m high forming what might have been part of a circle, which would have been about 10m in diameter. 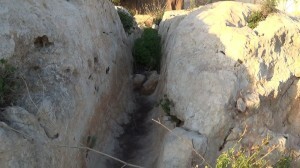 It was just over the road from what is believed to be Borg il-Gharib temple. 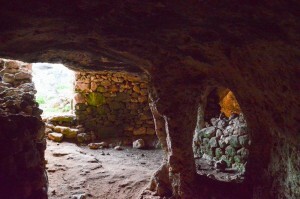 We visited some different tombs or rooms cut into the rock, of which there were many all over the island, in fact we think it is highly likely that there is more under the ground that above it. 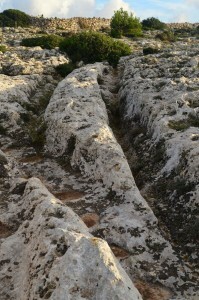 These rock-cut chambers close to Mgarr are cut into the side of a hill and vary in size from one room of 2m x 3m to a corridor leading into the hill with several rooms sprouting from it. There were around 10-15 chambers that we could find which were formed over multiple levels, it is not known when they were cut. More rock-cut chambers as well as a silo and some other structures that were so eroded it was hard to tell if they were standing stones or part of a temple. 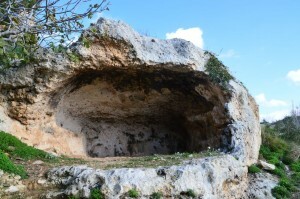 Officially this crypt of St. Agatha was a just a natural cave, which was enlarged in the 4th or 5th century. 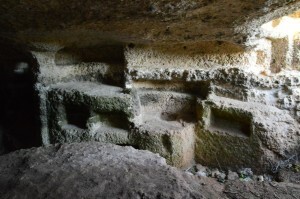 It consists of narrow rock-cut passages with graves/chambers that are the same shape and size of coffins, there are also a variety of shapes cut into the rocks such as large circles or rectangular cavities. We lied down in these coffin shaped chambers and played with harmonics, if we hummed we could make the chamber vibrate and the sound could be heard throughout the catacomb. We met with John Mizzi, a shamanic pagan who claims to be in touch with a priestess from Atlantis. We met with him to hear his story about meeting the priestess who still lives in the astral plane and contacted him to protect Ta Cenc, a sacred area of land on Gozo. He kindly showed us Ta Cenc, a sacred place with dolmen, cart ruts and temples, which he has been fighting to protect from land developers, and an ancient temple where the priestess resides which has a lot of energy. Another mystery about the temple builders of Malta is what happened to them, they seemed to disappear so suddenly in 2500-2200 BC. Some have hypothesized that they moved to Egypt and used the knowledge they had gained on Malta to start building pyramids and others have suggested that this time coincides with the changing of the zodiac sign (from Taurus to Aries ) so maybe the powers the temples possessed vanished.